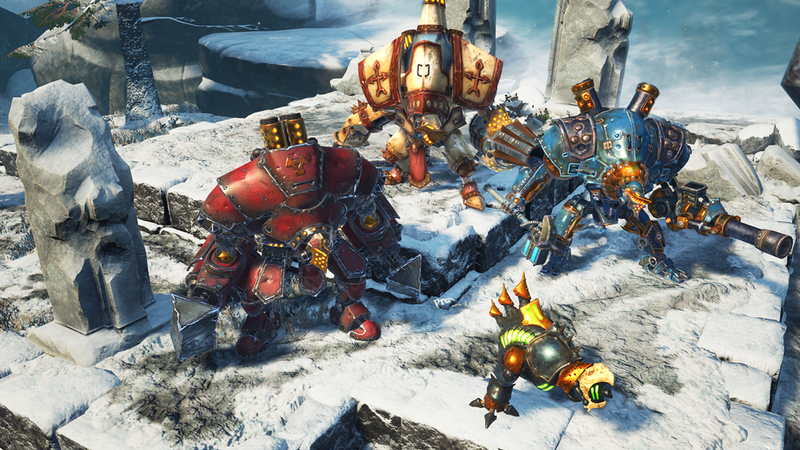 Warmachine: Tactics Early Access Beta Now Available in Standard Edition on Steam! Privateer Press Interactive has announced that the Standard Edition of Warmachine: Tactics is now available on Steam Early Access for $39.99. Based on the award-winning Warmachine tabletop miniatures game, Warmachine: Tactics is a turn-based, squad-level strategy game for PC and Mac developed in cooperation with WhiteMoon Dreams and published by Privateer Press Interactive. The multiplayer beta pits two forces against each other in a deadly close-quarters encounter featuring a variety of steam-powered robots and spell-slinging warriors. Funded through Kickstarter a year ago, the campaign reached nearly 300% of the project’s goal and remains one of the top 40 funded Kickstarters of all time. Pre-release versions of Warmachine: Tactics were demonstrated at PAX East, E3, and San Diego Comic-Con, and the game will be at the Privateer Press booth at PAX Prime. The Beta Standard Edition of Warmachine: Tactics includes beta access and all the features and content of the Standard Edition, including all updates as they become available. Also currently available is the $64.99 Deluxe Edition, which includes the same content as the Standard Edition plus additional downloadable content to be released over the upcoming months. Check out below the jump to see what you get with each edition. Four armies representing the four core factions of the Iron Kingdoms. Each army contains two warcasters, multiple warjacks, and multiple warrior units – 40 units currently with more coming. Two multiplayer maps – Trenches at the Border and Forest Ruin. More maps coming soon! One single-player scenario that introduces new players to the game before diving into multiplayer. AI Skirmish mode (Onslaught) coming soon! New units, maps, and functionality will be continuously released during Early Access, so keep checking back to see what’s new. An epic single-player campaign featuring 21 missions over 21 unique maps, and an engaging storyline that will immerse you in the world of the Iron Kingdoms. Four factions, each with two warcasters, four warjacks, and multiple warrior units. A point-based squad customization system that allows you to decide exactly what units you take into battle. A revolutionary unit coloring system offering nearly unlimited visual customization of your squad. Hot Seat mode, allowing multiplayer on a single computer. Team up with or fight against computer controlled AI. Special game modes like Take and Hold and Teams. Expand your experience with regular releases of new units and campaigns, available for purchase through the Steam store. Multiplayer maps will be released regularly, always for free! Also currently available is the $64.99 Deluxe Edition, which includes the same content as the Standard Edition, as well as additional downloadable content to be released over the next two months. Magnus the Traitor Mercenary Warcaster. Four unique Character Warjacks [of the Apotheosis] — one for each of the core factions. Four massive Warcasters [of the Apotheosis] — one for each of the core factions.